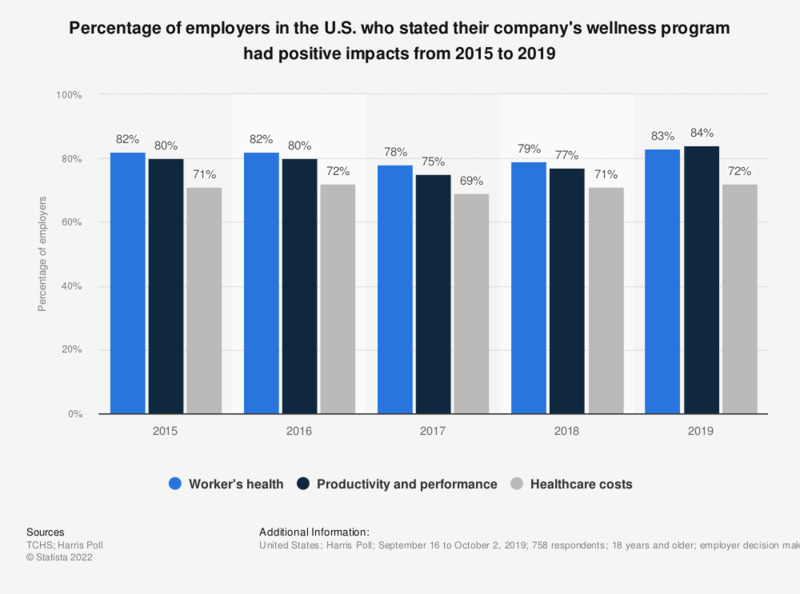 This survey shows the percentage of employers in the U.S. who stated their company's wellness program had positive impacts from 2015 to 2018. Almost 4 in 5 employers said their workplace wellness program positively impacted worker's health, productivity and performance and around 7 out of 10 employers felt the same for healthcare costs as of 2018. Original question: What impact has your workplace health promotion program had on… (please use the following scale)? Surveys for 2015 and 2016 were carried out between August and September of the respective years, while the survey for 2017 was carried out between July and August of that year. How often does your wellness program send you specific actions to take to maintain/improve your health?